Be sure to check your status for graduation with your advisor and review Graduation Preparation. Apply for graduation at least two (2) semesters early. Share in the excitement by tagging your social media with #MGAgrad. Caps and gowns will be available starting Thursday, April 4th at the Macon Campus Store or on our website https://campusstore.mga.edu. 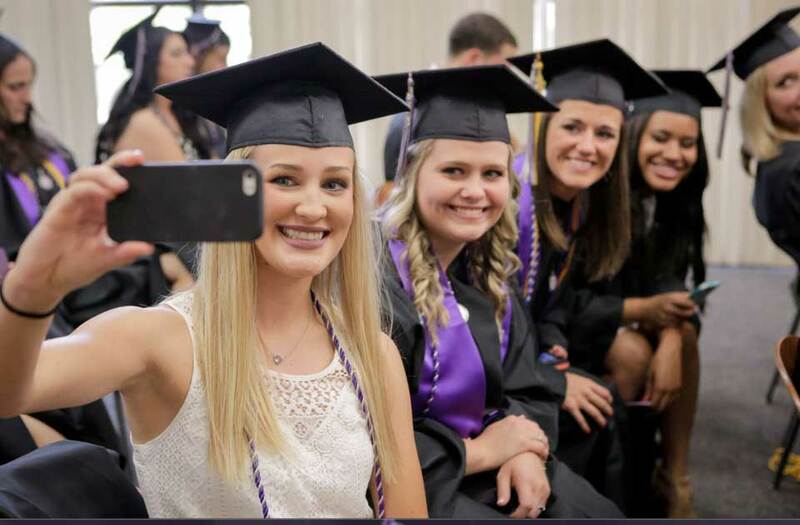 Graduates – help surprise your loved ones by submitting selfies! These can be of you alone or with people who encouraged and inspired you as you journeyed toward completion of your degree. If we get a sufficient response, we'll create a slideshow and present it on the big screen as the audience begins to gather prior to the ceremonies. Send photos to marketing@mga.edu. Include your full name and major. Professional attire is appropriate for the ceremony. Preferred attire is dark clothing and shoes. You will be standing and walking on hard flooring. You are strongly encouraged to wear comfortable shoes. You will be walking approximately half of a mile on various surfaces that may be slick and/or difficult to navigate in heels. You will be walking on jointed staging. Keep this in mind when selecting shoes. For the 4:00 p.m. ceremony, you should plan to arrive no later than 2:30 p.m. Park in the *East Parking Lot. Report to the lobby of the Student Life Center on the Macon Campus for directions to your check-in station. If you have mobility, visual or hearing impairment or if you need any special assistance, please notify the Allen Chastain in the Office of Disability Services as soon as possible. Faculty marshals will assist you in lining up by degree and in alphabetical order. Regarding the processional (march in) and recessional (march out), you will follow Faculty Marshals from your academic school in to and out of the arena. Be prepared for the ceremony to last approximately 1.5 hours. You may be photographed/videotaped by local media. Remove your gum before the processional. Live streaming of the graduation ceremonies will be available for viewing over the Internet from any location in the world. This is an excellent viewing option for family and friends of graduates who are unable to attend graduation. The link to the broadcast is www.mga.edu/live.